Photo: Ulysses S. Grant Home, ca. 1860, 511 Bouthillier Street, Galena, IL. 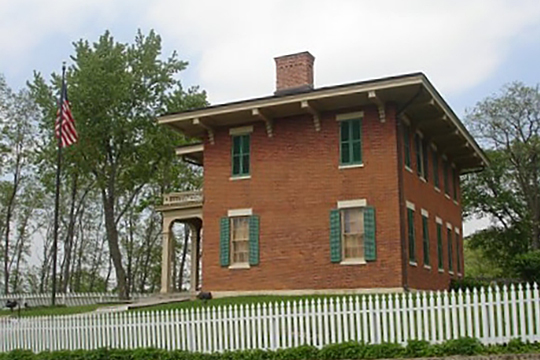 The home was given to Grant by residents of Galena in 1865 as thanks for his war service. Listed on the National Register of Historic Places in 1966. Photographed by user:Jesster79 (own work), 2006, [cc-by-3.0 (creativecommons.org/licenses/by/3.0)], via Wikimedia Commons, accessed November, 2015. Jo Daviess County administrative offices are located at 330 North Bench Street, Galena, IL 61036; phone: 815-777-0161. While lead mining and Galena dominate the story of early Jo Daviess County, they are by no means the only story. The County was established in 1827 and included all or parts of nine present-day counties. It was named after Col. Joseph Hamilton Daveiss ("Daviess" was an incorrect spelling that was included in the original legislation). Daveiss was a prominent Kentucky lawyer who married the sister of U.S. Chief Justice John Marshall. In 1811 he was appointed a Colonel in the Kentucky militia and achieved considerable fame by leading a gallant charge against the Indians at the Battle of Tippecanoe (Indiana). Unfortunately, he died in the process, but his name lived on, given to counties in Kentucky, Indiana, Illinois and Missouri—wherever Kentuckians migrated. Because early Illinois and Jo Daviess County were settled by so many with Kentucky roots, our county was so named. Following the initial migration from the southern part of the State, Jo Daviess County attracted other groups as well. Tin miners from Cornwall and lead miners from the Yorkshires of northeast England came. Many Irish came, most as unskilled laborers who worked in the mines, on the farms and elsewhere. Most of the Irish were Catholic, but some were Protestants, most from what is now Northern Ireland. The largest numbers of Irish came during the 1840s because of the potato famines. Huge numbers of Germans also came during the 1840s and 1850s, often because of political and economic unrest in Europe. Galena took in large numbers, but so, too, did farming areas like Menominee, Guilford and Elizabeth townships. In addition to farming, the Germans came as furniture makers, cobblers, carpenters and professionals. Some of the farmers who bought up land in the eastern side of the county moved there from southeastern Pennsylvania, where they had lived for generations. Perhaps the largest influx of new residents prior to the Civil War were those from New England and New York. With the opening of the Erie Canal and Great Lakes to steam boat travel, they flooded northern Illinois and Southern Wisconsin. As a result, the County became more like the rest of northern Illinois in terms of its outlook and institutions. Southern traditions were still strong, however, and it took three tries before the County gave up its southern county commissioner form of government and adopted the New England Township and County Board of Supervisors form of government in 1853. The new Republican party, in place by 1856, was overwhelmingly adopted by these northern settlers—New England was traditionally anti-slavery and this central tenant of the new Republican party caused most of Jo Daviess County to vote overwhelmingly Republican. Congressman Elihu Washburne, Robert Norris, Augustus Chetlain, Simeon Miner and brothers Halstead S. and George N. Townsend were key players in the formation of the party in the county. There were two exceptions to this trend, still evident in the county today in the Galena and the Dunleith-Menominee areas. Many Galenians still had economic, if not social, ties to the South. While not pro-slavery, many believed in the Democratic party's "go slow" attitude on the slavery issue and many felt that individual states should have the right of self-determination. The Republicans were too radical for them. The Dunleith-Menominee area, like Galena, received large numbers of Irish and German Catholics. They were part of a larger movement that saw the early Catholic Church actively soliciting Catholic immigrants to come to Dubuque and the surrounding area. Due to the efforts of Church leaders like Father Samuel Mazzechelli and Bishop Loras, the Dubuque area became a welcoming destination for the Catholics on an otherwise Protestant frontier. The Democratic party, after a slow start, began to actively court the Irish and Catholic vote, making much progress by the time of the Civil War. Thus, the ethnic and political nature of Jo Daviess County was largely in place by 1861 and has largely remained so to the present day. It was out of this wealth of peoples, occupations and values that came the self-reliance, thrift, independence and enterprise that have traditionally characterized the county's population. The Civil War marked the end of new migrants coming into Jo Daviess County. The land had all been taken up—new settlers had to go west to find more. Agriculture was the overwhelmingly dominant industry in the county, as it had been since 1850. The coming of the Illinois Central Railroad in 1854 had given an incredible boost to commercial, market-oriented agriculture with wheat becoming the number one cash crop. By the time of the Civil War, the northern Illinois counties that lay along the Illinois Central Railroad represented the largest single wheat producing region in the world. After the War, stock raising took precedence. Jo Daviess County's population peaked in the 1870s. Thereafter, most townships slowly declined in population as agriculture became increasingly mechanized and efficient, a trend still going on today. The towns and villages grew somewhat, particularly those along the railroad. Agriculture has continued as the dominant industry in most of the county, but with larger farm units and fewer farmers.